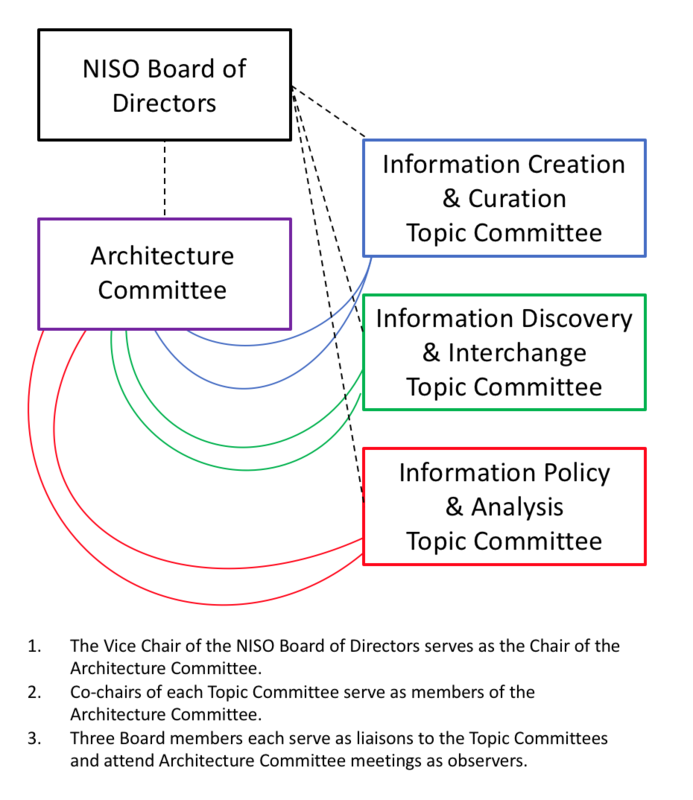 The NISO Architecture Committee was formed in early 2007 in response to a strategic restructuring. The Architecture Committee is responsible for providing strategic direction for the organization, provide oversight and leadership for standards development in areas new to NISO, and coordinate with and provide guidance to the NISO Topic Committees (Information Creation & Curation, Information Discovery & Interchange, and Information Policy & Analysis). The NISO Framework is laid out fully in the article, "NISO Framework to Direct New Committee Governance Structure," written by Todd Carpenter, NISO Managing Director (now Executive Director), for the NISO journal Information Standards Quarterly (ISQ -- Volume 19, issue 2/3 -- April/July 2007). The Framework is "an overarching model and roadmap for all of NISO’s standards work" and is reviewed regularly by the Architecture Committee. In 2014, the Architecture Committee, together with the full Topic Committees, reviewed its areas of work and performed some analysis of relationships. The resulting NISO Strategic Directions document, published in January 2015, is an affirmation of the continuing validity of the Framework.